Looking for new, healthy treats for the kids? With school creeping around the corner, I know I am. If you haven't yet tried Snikiddy, I wholly recommend you do! Learn more about Snikiddy on Facebook! You can even enter weekly drawing for a Snikiddy Gift Box! 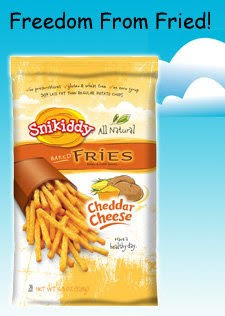 My snackers loved the sample we received from Snikiddy, the Cheddar Cheese Fries. They were crunchy, light, non-greasy with distinct cheddar cheese flavor. We were even left with LESS cheesy residue on the fingers than some from some similar products on the market! That's a big plus for me, as it means I can send a pack in my son's lunch and not worry that he's walking around with an orange face all day! Ready to try Snikiddy out with your snackers? Courtesy of Snikiddy and Smile.ly, three of my readers can win a sample pack! Giveaway is open to residents of US & Canada, ages 18+ and will end on Saturday, August 28, 2010 at midnight EST. Winners will be selected via Random.org and notified by email, so please leave your email address! Winners will have 48 hours to respond. To enter, you must follow my blog in some fashion, whether it be via Google Friend Connect, email or RSS feed subscription or via twitter. Like Snikiddy on Facebook, write on their wall, letting them know that you heard about Snikiddy from Tsue at That's What She Said. Come back and leave me a comment letting me know you did so and leaving your FB name. THIS GIVEAWAY IS CLOSED. THANK YOU TO ALL WHO PARTICIPATED. CONGRATS TO VICKY S, COMMENT #1; SABLE, COMMENT #4 AND SUSAN, COMMENT #30, COURTESY OF RANDOM.ORG! 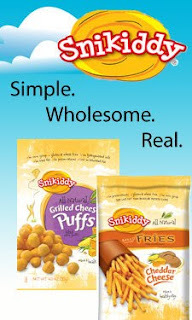 I received a sample of Snikiddy Cheddar Cheese Fries Snack from Snikiddy and Smile.ly to review for this post. The images and information about Snikiddy are taken from various Snikiddy sites. The opinions stated above are honest and my own. I think my family would like the nacho cheese puffs the best. I Like Snikiddy on Facebook, & wrote on their wall. Kelley L***** I was sent here by Tsue at That's What She Said. I have been dying to try the buffalo flavor and I can not find these things anywhere near me!